Biliran is surrounded by mountains which explains the province’s abundant rivers and waterfalls. While I have been to two of their waterfalls during my summer trip with friends, I am certain Biliran has a lot more to offer. Some of them are found on the way to Tres Marias. Tres Marias is the second highest mountain in Eastern Visayas towering at 1315 MASL. It is comprised of three adjacent mountain peaks which were said to be named after three Maria fairies, two of whom are Maria Benita and Maria Canabe. The third remains a mystery — or perhaps she has just arrived. With the schedule moved a little later, we hurried to Almeria, the jump-off point, after our last-minute errands in Naval. Hiking with me are Shiela, Ryan, Chiarra, James, Zeke, An Jurvel, Shandy, La Yell, Paul, Jovy, Lochie, Rell, Hardi and Renson. The sky was clear yet we all prepared ourselves for the unexpected. Or so we thought. We had our stuff waterproofed in case of rain and brought raincoat ponchos to avoid getting drenched. But we missed one thing. We were bound to get wet even on a sunny day. One of the adventures that await Tres Marias hikers is the long and exciting river trekking. Just a few minutes away from the start of our trek, one can already hear the gushing sound of its waters. At first we tried to not get our shoes soaked but most of us changed to slippers/sandals in the end. We crossed streams, moved from one point of the bank to another, and jumped over stones. All these while admiring the beauty of Biliran’s rivers. Our guides advised us to skip Ulan-Ulan Falls and Recoletos Falls on the first day so we can catch up with the time that we lost. We passed by one of their many unnamed waterfalls and the recently christened Urduja Falls (named after the 2017 tropical storm which created it). Later on, we reached Nomads Falls (named after a mountaineering group in Cebu City under Inter-Mountaineering Society). But just like the previous falls, no matter how inviting, we had to move along and be content with the view. After two hours of river trekking, we reached a creek where we took our lunch under the shade of tall trees. Some of us also took a dip in the waters. Not too far from where we had our lunch break was the bend that ends of our river trekking. What comes next is a forested trail going to the campsite. Surprisingly, we found a funny resemblance to Cebu’s Spartan Trail: the canopied footpaths and the gradual assault. There was an air of familiarity, which made the hike less arduous. We reached the campsite at 3pm, relatively faster than we expected. By that time, Kampo Kwatro (a Cebu-based mountaineering group) had already set up their hammocks and tent. The site can only accommodate a limited number of tents due to the lack of camping ground. Fortunately, there was enough space for the rest of us. The noise amplified when we had our socials. Aside from pang of alcohol, it was the S-game that brought us laughing out loud. After lights out, the innocent night (and minds) was tainted by the puns of the ‘gors’ Paul and La Yell, and the gags of Chiarra, Renson, James and Zeke. Waking up knowing we are about to reach the summit of Naliwatan Peak gave us enough drive to start the day early. After coffee and breakfast, we headed straight to the trail — and trust me when I say that it felt like poetry coming to life. We entered into a forest with its mossy trees blanketed with thin fog. Our eyes feasted with the dark greens and the biodiversity that await us. There were flora growing everywhere in the dense rainforest, serving a home to a variety of snakes and wild cats. There were no other sound but the chirp of the birds, the gust of the wind and the beat of our hearts. Upon reaching the summit, we were welcomed by a blur. The peak was supposed to give you a 360-degree view by climbing on trees but thick cottony fog covered the surroundings. Despite the strong gust of wind and a white background, we perched atop the iconic tree branches. We had no clearing but one this is clear: watching nature unfold before your eyes was an experience that is hard to forget. With the weekend escape coming to an end, we trekked our way back to the jump-off point. From yesterday’s assault, we headed to a steady descent. Most of us are excited to get back to the rivers but what we didn’t know was there were a few more (mis)adventure that we needed to face. We finally get to stop at Nomad Falls for our lunch. It’s an isolated waterfall with a diagonal slide. Shout out to Zeke for being our official Tres Marias head chef! After lunch, our guides told us that we would be taking a slightly different route to see Recoletos and Ulan-Ulan Falls. I’d say, “slightly different” should have been “slightly difficult”. 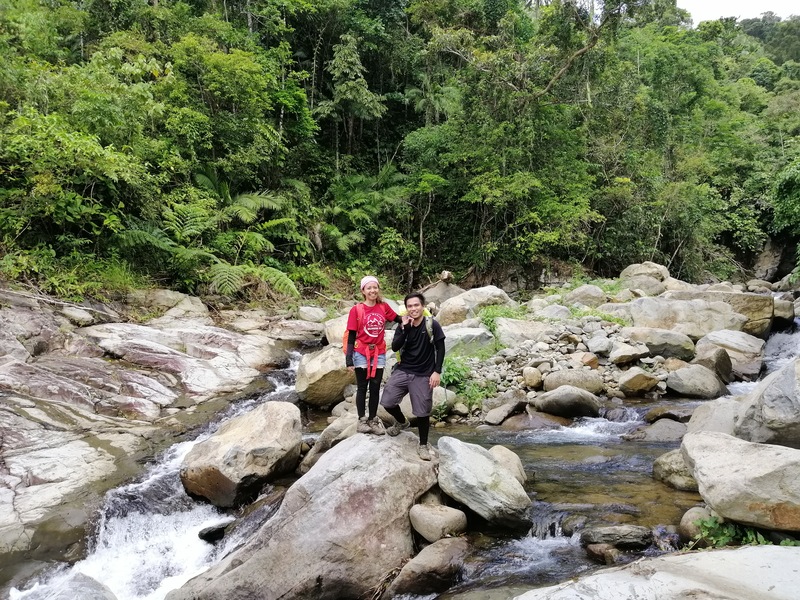 We had to pass through slippery rocks, hug huge boulders, slide on slopes and the last part, cross the rushing waters above the 90-feet high Ulan-Ulan waterfalls. Check out these videos from Paul and Shandy dope! Wow, I truly enjoy reading your blog post. This actually made me remember my trek to Tres Marias more than a year ago. During our visit, we weren’t able to see the 360 views at the peak as well. Anyway, just like you guys, the experience we had was also unforgettable.